Close windowMarine surface area of the perimeter (in square kilometers). This is declaratory information. Close windowTotal surface area of the perimeter including marine and land parts in the case of so-called 'mixed'sites (in square kilometers). This is declaratory information. 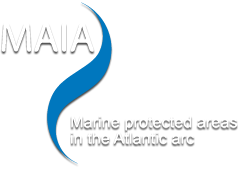 Je viens de consulter cette page, http://www.maia-network.org/homepage/marine_protected_areas/mpa_data_sheets/an_mpa_datasheet?wdpaid=139577&gid=1066, je te la conseille.